LONDON -- It is an old debating point: Do the times make the man, or does the man make the times? In the case of Winston Churchill, whose death 50 years ago Saturday the British are remembering with more than nostalgia, it is both. The times in Churchill's case were both World War I, in which he served as a battalion commander, and World War II, which he helped win for Britain and America. By the standard he set, all political leaders since -- with the possible exception of Margaret Thatcher and Ronald Reagan -- are mere pygmies. Yet, even they pale in his shadow. No one else can touch Churchill for his vision, leadership and most of all persistence. 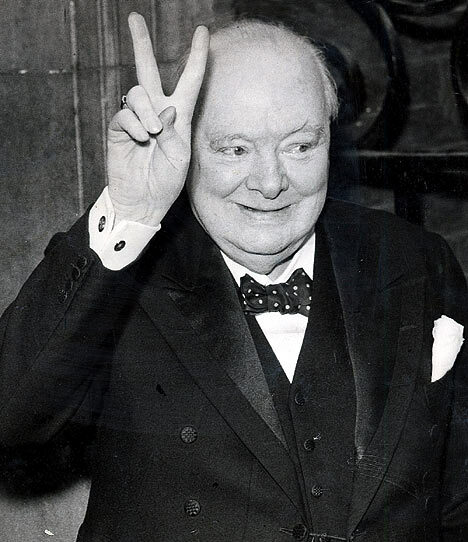 Like Babe Ruth who struck out a lot, but who also hit many home runs, Churchill "struck out" more than once, but his successes far outweigh and overwhelm his failures. London Mayor Boris Johnson has written a wonderful book called "The Churchill Factor: How One Man Made History." Not only did Churchill make history, he bent it to his will and still today embodies the classic definition of a leader. He had many contemporary enemies and there are those in Britain who still believe he was too full of himself and that many of his ideas were ill conceived. Yet, his achievements were so momentous those voices get little attention outside academic circles and left-wing media who have forgotten how to fight and win wars. Churchill had a way with words that conveyed great truths and necessarily stirred the hearts of his countrymen. Probably his best-known words were uttered after the RAF defended Britain from bombings by the German Luftwaffe: "Never in the field of human conflict has so much been owed by so many to so few." In 1942, following the Allied victory near the Egyptian coastal city of El Alamein, which marked a turning point in the Western desert campaign, Churchill said: "Now this is not the end. It is not even the beginning of the end. But it is, perhaps, the end of the beginning." Churchill wrote, spoke and did things that endure. What modern politician can match his clarity of thought, writings and voracious reading? His 1946 "Iron Curtain" speech at Westminster College in Fulton, Missouri, foresaw the Cold War with the Soviet Union. Of the man, Boris Johnson writes, "...you are acutely aware of being chained to a genius, and a genius of unbelievable energy and fecundity." Churchill, notes Johnson, "produces more published works than Shakespeare and Dickens combined, wins the Nobel Prize for literature, kills umpteen people in armed conflict on four continents, serves in every great office of state, including prime minister (twice), is indispensible to victory in two world wars and then posthumously sells his paintings for a million dollars." Churchill had a far less than ideal upbringing. His father, Randolph, mostly rejected him and gave him, not love, but criticism; his mother pushed him but was often preoccupied with a series of men not her husband; he was small and often the object of bullying, but he overcame it all through the force of his ego, strong will and persistence ("Never give in, never give in, never, never, never -- in nothing, great or small, large or petty -- never give in except to convictions of honour and good sense. Never yield to force; never yield to the apparently overwhelming might of the enemy." I recall the TV coverage of his 1965 state funeral. Thousands lined London streets. Dockworkers lowered their cranes in tribute as his body was borne down the River Thames on a barge. Churchill was more than a leader for his time. He was a man for all time; a man for all seasons, as Robert Bolt titled his play about Sir Thomas More. Johnson concludes his book: "There has been no one remotely like him before or since." The world is the worse for it.